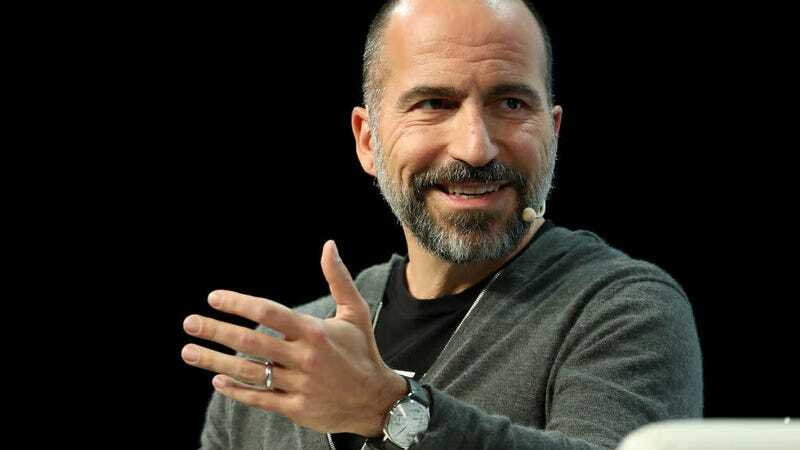 Uber, the money-losing ridehailing platform which by its own admission in its S-1 filing claims it has “incurred significant losses since inception” and “may not achieve profitability,” has overcome a lot on the road to today’s initial public offering. It’s entire business model however—which involves cost-cutting by arguably misclassifying the overwhelming majority of its workforce—is precarious, and any number of obstacles could easily send its soon-to-be-public stock on the same downward trajectory as its chief competitor. What might those hurdles be for a company which had “an accumulated deficit of $7.9 billion” as of last New Year’s Eve? Take it away, Uber. Our business would be adversely affected if Drivers were classified as employees instead of independent contractors. The independent contractor status of Drivers is currently being challenged in courts and by government agencies in the United States and abroad. We are involved in numerous legal proceedings globally, including putative class and collective class action lawsuits, demands for arbitration, charges and claims before administrative agencies, and investigations or audits by labor, social security, and tax authorities that claim that Drivers should be treated as our employees (or as workers or quasi-employees where those statuses exist), rather than as independent contractors [...] Furthermore, the costs associated with defending, settling, or resolving pending and future lawsuits (including demands for arbitration) relating to the independent contractor status of Drivers could be material to our business. Good thing that last part isn’t happening on a massive scale anywh— oh. ...a case which was ruled unfavorably to businesses like Uber’s. Our success in a given geographic market significantly depends on our ability to maintain or increase our network scale and liquidity in that geographic market by attracting Drivers, consumers, restaurants, shippers, and carriers to our platform [...] If our service quality diminishes or our competitors’ products achieve greater market adoption, our competitors may be able to grow at a quicker rate than we do and may diminish our network effect. Can’t see any reason consumers would be unhappy with the quality or safety of the service, or would have moral objections to using it. [A] backlash against us in response to accusations that we intended to profit from a protest against an executive order banning certain refugees and immigrants from entering the United States spurred #DeleteUber, a social media campaign that encouraged platform users to delete our app and cease use of our platform. As a result of the #DeleteUber campaign, hundreds of thousands of consumers stopped using the Uber platform within days of the campaign. Oh right, that. Wait, hundreds of thousands, you say?! New York recently imposed a driver cap and minimum wage requirements. California drivers went out on strike to achieve the same goals. Connecticut is leaning towards passing similar legislation. Continued Driver dissatisfaction may also result in a decline in our number of platform users, which would reduce our network liquidity, and which in turn may cause a further decline in platform usage. Uber drivers in India and the UK have gone on strike en masse. Taxi workers have struck to demand caps on ridesharing in Germany and Spain. U.S.-based drivers are engaged in collective action, too. Our focus on aggressive growth and intense competition, and our prior failure to prioritize compliance, has led to increased regulatory scrutiny globally. Uber has been criticized for fostering a persistent culture of sexual harassment, been sued for alleged theft of trade secrets, and used data collection to evade authorities. 15% of our Ridesharing Gross Bookings from trips that either started or were completed at an airport [...] Certain airports currently regulate ridesharing within airport boundaries, including by mandating that ridesharing service providers obtain airport-specific licenses, and some airports, particularly those outside the United States, have banned ridesharing operations altogether. [...] Additional bans on our airport operations, or any permitting requirements or instances of non-compliance by Drivers, would significantly disrupt our operations. Seems like a smart bet that they’ll just stop. An autonomous Uber vehicle struck and killed a woman in Tempe, Arizona last summer. Economists are predicting another recession very soon. Uber exposed the personal data of almost 60 million people, then hid that fact for over a year. It ended up settling the resulting lawsuit for $148 million. They may not be entirely competent. We may not be able to manage our growth effectively, which could damage our reputation and negatively affect our operating results. Even their successes are likely to become fuckups. In 2019, we plan to release a transparency report, which will provide the public with data related to reports of sexual assaults and other safety incidents claimed to have occurred on our platform in the United States. The public responses to this transparency report or similar public reporting of safety incidents claimed to have occurred on our platform, which may include disclosure of reports provided to regulators, may result in negative media coverage and increased regulatory scrutiny and could adversely affect our reputation with platform users. Uber would like your investment money anyway.